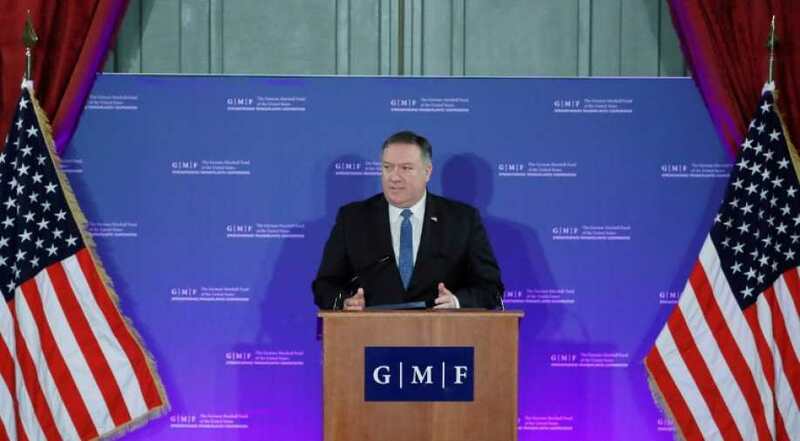 US Secretary of State Mike Pompeo vowed Thursday the United States and its allies would chase all Iranian troops from Syria, and urged Middle East nations to forge a common stand against Tehran. "It's time for old rivalries to end, for the sake of the greater good of the region," said Pompeo at a keynote address in Cairo. America "will use diplomacy and work with our partners to expel every last Iranian boot" from Syria and bolster efforts "to bring peace and stability to the long-suffering Syrian people," he added. The top US diplomat was in Egypt on the latest leg of a whistle-stop regional tour aimed at shoring up Washington's Middle East policy following President Donald Trump's shock decision to withdraw 2,000 US troops from Syria. Pompeo stressed the pullout would go ahead, despite comments in recent weeks appearing to walk back Trump's decision, but that the US would remain engaged. The "decision to withdraw our troops has been made. We will do that. We will withdraw our forces, our uniformed forces, from Syria and continue America's crushing campaign," Pompeo told reporters at a joint press conference with his Egyptian counterpart Sameh Shukry. In his address entitled "A Force for Good: America Reinvigorated in the Middle East" at the American University in Cairo, Pompeo also took aim at former president Barack Obama without naming him. Trump's predecessor had "grossly underestimated the tenacity and viciousness of radical Islamism," Pompeo said. And parroting Obama's words in his landmark 2009 speech in Cairo, Pompeo vowed that now was really "a new beginning" in ties between the US and the Middle East. Pompeo's tour is aimed at urging regional allies to continue to confront the "significant threats" posed by Iran and jihadists. Even though Islamic State group jihadists have been largely eradicated from Iraq, after capturing a vast swathe of territory in 2014, some still control a few pockets in war-torn Syria. Pompeo will also visit Gulf countries including Bahrain, the United Arab Emirates, Qatar, Kuwait, Oman and Saudi Arabia. But there are rising concerns that US policy is getting bogged down. A long-promised Trump plan for a peace deal between Israelis and Palestinians has so far failed to materialise. And many of the Trump administration's decisions have stoked confusion and angered many regional allies. "By most accounts, Trump's Middle East policy has made a messy Middle East even messier," Aaron David Miller, a former US diplomat and now an analyst at the Wilson Center, said on Twitter. "A risk averse president who makes new policy by tweet or phone call surrounded by risk-ready advisers who run cleanup, don't respect deliberation and have objectives that aren't clear or attainable equals US policy (or lack of it) in Syria." Turkish officials had a tense meeting this week with Trump's national security adviser John Bolton in Ankara aimed at coordinating the pullout process after Bolton set conditions that appeared to postpone it indefinitely. The terms included total defeat of IS -- still active in some Syrian regions -- and ensuring that Kurdish fighters who fought alongside the Americans against the jihadists will be protected.